Like brother like sister! The Congress belief that Jaganmohan Reddy's jail term would dent the YSR Congress's popularity in Andhra Pradesh takes a hit with his sister Sharmila proving to be yet another crowd-puller. Vicky Nanjappa reports. One may have expected the death of the YSR Congress, after the arrest of its president Jaganmohan Reddy for alleged financial irregularities. But the CBI's move only seems to have won more sympathy from supporters. And if one goes by numbers attending Jagan's sister Y S Sharmila 3,000 kilometre padyatra across Andhra Pradesh it has only increased the prospects of the party. Clad in a salwaar kameez and sporting a pair of sneakers, 34-year-old Sharmila set off on her padayatra keeping the 2014 assembly elections in mind. This march is extremely crucial to the fading enthusiasm of the YSR Congress party, especially after Jagan's arrest. Sharmila's rally has drawn huge crowds and the YSR Congress is now confident that she can step into her brother's shoes. Sharmila is no stranger to crowds. She accompanied her father -- late Y S Rajashekara Reddy -- on his campaigns, which led to the Congress to power during the previous election. 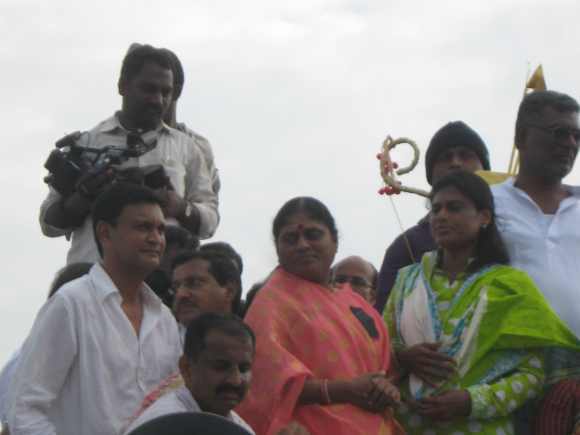 She kickstarted her padayatra from her home district Kadapa and as expected her rally got a massive response. Covering 450 km, she found herself treading on hostile territory -- the Telangana region. And surprisingly, she continued to be a crowd-puller. Jagan's party has been non-committal on the Telangana issue and many in the region view him as an enemy of the formation of a new state. However, Sharmila enjoyed the popularity of the public in this region too. There were no signs of any hostility and people came forward to meet her. It would be hard to say how many of these would be voters though. She was accompanied by her mother Vijayamma in Telangana and the rallies at Mahboobnagar and Pulloor went off without any hitch. However, it didn't go unnoticed that the mother-daughter duo was mum on the Telangana issue. Their stand remained the same as Jagan's, who had said during the plenary of the party, that Telangana is something for the government to decide. Sharmila during her address said that the development of Telangana was one of the party's main agendas and it was the dream of her father. "We must strive to bring back the golden era of my late father." She struck an instant chord when she spoke about the numerous suicides in the Telangana region and said that their sacrifices must be remembered and not forgotten. The Congress, however, is not too worried about the impact that the YSR Congress party made in Telangana. There is talk that they will announce the formation of the state as the elections nears and this would ensure that they walk away with all the votes there. However, the Rayalseema and Andhra region is what they appear to be most worried about. When Sharmila was in Rayalseema, she drew a mammoth crowds and this has left the Congress shaken, leaving them pondering on whether they would retain Andhra Pradesh or not. Congress sources in Andhra Pradesh say that they are in discussion and holding talks with their party high command about the sudden surge in support that Sharmila and her mother Vijayamma have been able to draw. It hardly matters that Jagan is in jail, a Congress leader told rediff.com. Many observers say that Sharmila and Vijayamma have a better advantage today. They have clean records with no charges of corruption against them and are not bogged down by the ruling party's threats of a CBI case. In their speeches, the mother-daughter duo often refers to the death of YSR and the unjust manner in which Jagan has been jailed. They appear to be an instant hit with the older generation and their support base especially in the rural areas has increased twofold, according to political observers in Andhra Pradesh. Sajjala Ramakrishna, a leader in the YSR Congress party, said, "The more Jagan is harassed, the more the YSR Party stands to gain. 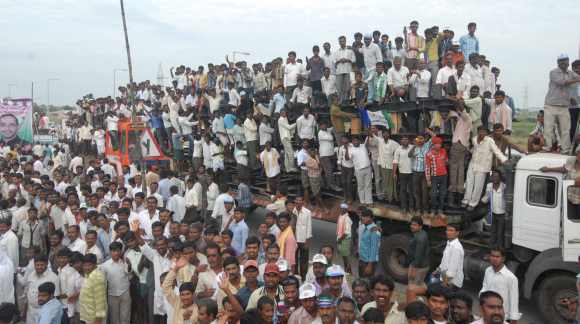 The people of Andhra Pradesh are coming out in huge numbers because they are supporters of YSR, who was always pro-poor. Clearly, the growing popularity of the party is likely to impact the Congress and the Telugu Desam Party. Jagan may not be cleared of charges before next year's polls, so it going to be a mother-daughter show all the way. While there are many fence sitters in the Congress and the TDP, the real impact of the YSR Congress party would be felt as the elections inch closer. Sources in the YSR Congress said that they expected many defections. At least five leaders from the TDP and the Congress have met Jagan in jail and expressed their desire to join the party, said insiders. YSR Congress leaders however ruled out the possibility of either Vijayamma or Sharmila becoming the next chief minister of Andhra Pradesh. They are confident that Jagan would be out of jail by the time the results are announced. Sharmila too echoed a similar view. "Jagan will be the next chief minister of Andhra Pradesh." However, the YSR Congress does have a Plan B in place. According to Jagan's orders, his mother Vijayamma will lead the party in case he is not released from jail. Political observers point out that the campaign led by Sharmila is not a run- of-the-mill one. She has hit the roads with a purpose and a sense of vengeance. She has vowed to bring the YSR Congress to power. 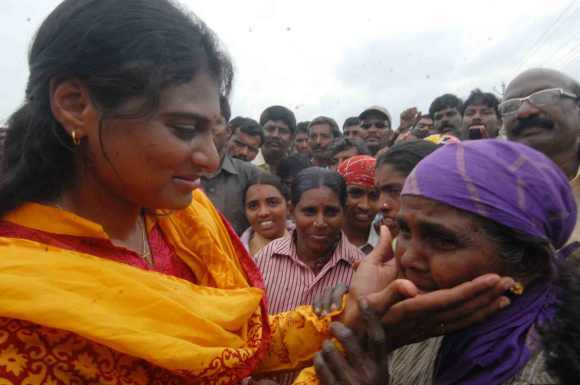 While she and her mother are out on the roads, trying to gather crowds and convert them into votes, it is Jagan who continues to call the shots from jail. 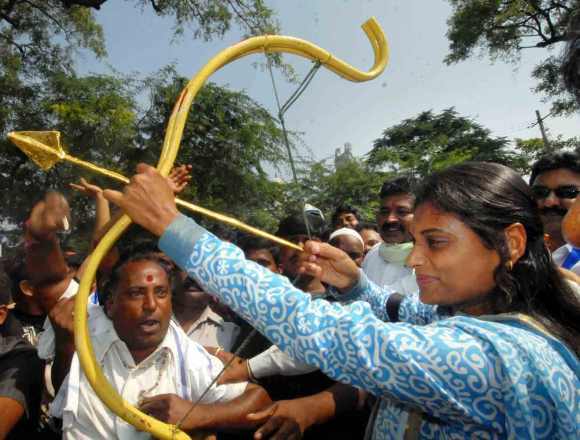 Will Jagan's sister take over YSR Cong's mantle?